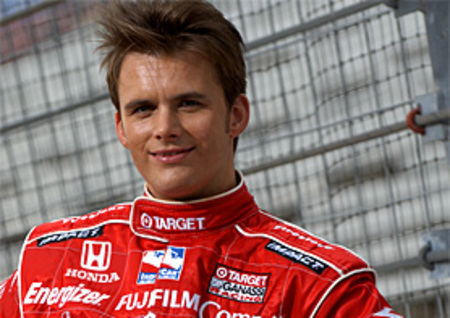 Dan Wheldon (who moved to the United States from his native England with hopes of winning the Indianapolis 500 and went on to twice prevail in the famed race) died Sunday after a massive, fiery wreck that involved 15 cars at the Las Vegas Indy 300. Mr. Wheldon (33) was one of the most popular IndyCar Series drivers. He called the Indy 500 “the biggest sporting event in the world,” and his second and final victory there came in most unexpected fashion. Trailing rookie JR Hildebrand with one turn remaining, Mr. Wheldon was resigned to finishing second for the third consecutive year. But Hildebrand brushed the wall seconds away from what seemed like certain victory, giving Mr. Wheldon one of the luckiest breaks in Brickyard history. He crossed the line in front, making the final lap the only one he led in this year’s race. “That’s Indianapolis” – Mr. Wheldon said a day later. “That’s why it’s the greatest spectacle in racing. Such was the case again Sunday in Las Vegas. Mr. Wheldon started last in the 34-car field for a chance to win 5 million dollars and was up to 24th quickly, but well behind the first wave of cars that got into trouble on the fateful 11th lap. He had no way to avoid the wrecks in front of him. There was no time to brake or steer out of trouble. His car sailed into the fence extending high over the track barrier. About two hours later, his death was announced. IndyCar will be under scrutiny to deliver answers following Dan Wheldon’s death in Sunday’s season finale at Las Vegas Motor Speedway. Wheldon had been helping to give them. Rideless after winning a second Indianapolis 500 in May, Wheldon was chosen to be the development driver of the Izod IndyCar Series’ new chassis that will debut in 2012. For months, he has been working with Dallara to prepare and test the car. Among the safety features – Bodywork covering the rear tires to prevent Indy cars from being launched as Wheldon was on lap 11 of the IndyCar World Championship. Wheldon’s car ran over a car spinning in Turn 2, and the aerial ride was horrific. The car appeared to flip upside down before slamming the outside wall and the fencing above it before being struck by disabled trailing cars. The incident started when Wade Cunningham slowed in turn one after light contact with fellow rookie James Hinchcliffe. At speeds in excess of 220 mph, the chain reaction of the back third of the record 34-car field was unavoidable. Wheldon’s wasn’t the only car to get airborne. Will Power’s did, too, and still pictures of it flying gave the appearance of the photograph being doctored. While Wheldon suffered fatal injuries, Power escaped with only a sore back. He was similarly taken to nearby University Medical Center for observation and later released. Rookies JR Hildebrand and Pippa Mann were hospitalized, their areas of concern not revealed. IndyCar officials said Mann has a hand injury. Townsend Bell, Tomas Scheckter, Paul Tracy, EJ Viso, Alex Lloyd, Buddy Rice, Vitor Meira and rookies James Jakes, Charlie Kimball and Jay Howard also were involved but not injured. Based on nothing more than one lunch and 90 minutes of interviewing, it is clear that the world of IndyCar racing will be hurting for quite some time. It has lost a tremendous young talent, as well as a tremendous young person. Yes, Dan Wheldon died doing what he loved to do. Yes, racing cars at speeds in excess of 200 mph is dangerous, and those who do it know it. And yes, his death in a fiery 15-car crash Sunday at Las Vegas Motor Speedway was so horrific that the word ‘carnage’ kept coming up in news reports. Those are the boilerplate observations. More appropriate at the moment is a discussion of the person he was. Wheldon was 33 years old, and a two-time Indianapolis 500 winner, including this year. He flaunted none of that. He looked you in the eye when he shook your hand, he asked questions as well as answered them, and he had a sense of humor that included a taste for others who also had one. Last Tuesday, Wheldon was on a promotional swing, creating media attention for the unique challenge he was attempting at the Las Vegas race. He would start last in a field of 34 and try to make his way all the way to the front at the end. If he did so, he would share 5 million dollars with a randomly selected fan. He was quick to put the promotion, and its gimmick aspects, into context. “I don’t need money to be the incentive” – he said. Others in sports’ saying that would prompt an eye roll. Wheldon, young, movie-star handsome, and ideally positioned to say something like that and not mean it, really did. After you’ve done several hundred interviews, it becomes easier to separate the hot dog from the bun. The interview took place at a Los Angeles restaurant. Wheldon was double-teamed by two sportswriters, both veterans of this and both longtime friends inclined to needle each other between questions. Wheldon seemed to enjoy the shots taken and given by Doug Krikorian, longtime Long Beach Press-Telegram columnist. He kept score and announced it at the end. This entry was posted on Monday, October 17th, 2011 at 3:04 am	and is filed under Tragedy. You can follow any responses to this entry through the RSS 2.0 feed. Both comments and pings are currently closed.